DCS for Redis is a standard, persistent in-memory database service. Based on an HA cluster architecture, it ensures high read/write performance. You can configure and launch cache servers within minutes with just a few clicks, buy on-demand resources, and migrate services to the cloud without any modifications.  DCS for Redis supports service migration without any modifications and monitors over 30 metrics for your services based on custom alarm thresholds and policies. Username/Password-specific access and audit logs keep your data secure and traceable. The HA architecture provides data persistence and backup mechanisms. Retrieve frequently accessed data (such as leaderboards) from an in-memory data cache instead of relying entirely on slower disk-based databases. DCS for Redis provides fast concurrent access to frequently requested data, such as best sellers and daily deals, and is scaled easily as loads increase. Data is automatically transferred to disks, maintaining long-term durability and security. Choose Redis to suit the needs of your applications. If a master cache node becomes faulty, the standby cache node will take over traffic within seconds. Redis is an in-memory data structure store. There are three types of DCS Redis instances: single-node, master/standby, and cluster. DCS clients will not perceive any failover because the instance IP address exposure remains unchanged. Redundancy is provided using master and standby instances. For cluster DCS instances, each shard is held on both master and standby nodes. Choose from single-node, master/standby, and cluster instances from 2 GB to 1024 GB. DCS instances scale without hits, as loads increase. Each DCS instance runs on only one cache node and provides 2 GB to 64 GB in storage capacity. This type of DCS instance is recommended when only caching is needed. Each DCS instance provides 64 GB to 1024 GB in storage capacity, and runs in cluster mode. This type of DCS instance is recommended when high scalability and concurrency are needed. 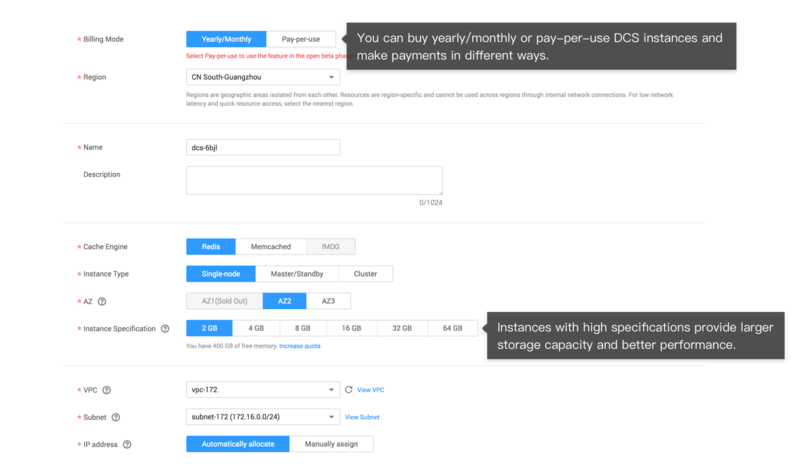 Each DCS instance provides 2 GB to 64 GB in storage capacity and runs on two cache nodes—one master and one standby. This type of DCS instance is recommended when high availability is needed. With just a few clicks on the DCS for Redis console, scale your instances to the needed capacity with no service downtime (cluster or master/standby instances), or with minimal interruption at the minute range (single-node instances). By default, data persistence is enabled for both master/standby and cluster DCS instances. Data is flushed to disks with second-level latency. You can initiate a manual backup at any time, or create policies to automatically back up data daily during off-peak hours. Each piece of data has three replicas. If an error occurs, or data becomes corrupted, you can restore your data from a backup with just a few clicks. Tenants in different VPCs or security groups cannot connect with each other or access each other's resources, keeping assets separated and compartmentalized if necessary. Resource usage metrics include CPU usage, physical memory usage, network input/output throughput. 1. Log in to the DCS console. 2. Click Buy DCS Instance, and configure the specifications. After you make the payment, the instance is created. DCS instances must run in VPCs. 1. On the DCS console, view the instance connection address and port number. 2. Log in to the ECS console and buy an ECS. Install Redis on the purchased ECS. 3. Use Redis CLI to connect to the instance. Read and write data from and to the instance. 1. The chosen ECS and the DCS instance must belong to the same VPC. 2. If the source Redis client is not on HUAWEI CLOUD, export your data files to a local PC and upload the files to an ECS before importing them to DCS. 3. If the source Redis is on HUAWEI CLOUD, your data files can be directly exported to ECS and then to the DCS instance. 4. If the source Redis client is on HUAWEI CLOUD but is not in the same VPC as the DCS instance, export your data files to a local PC and upload the files to an ECS before importing them to DCS. 1. Exercise caution when restarting a DCS instance, deleting a DCS instance, and changing a password. 2. To verify that modifications to configuration parameters have taken effect, observe instance performance for a reasonable period of time.